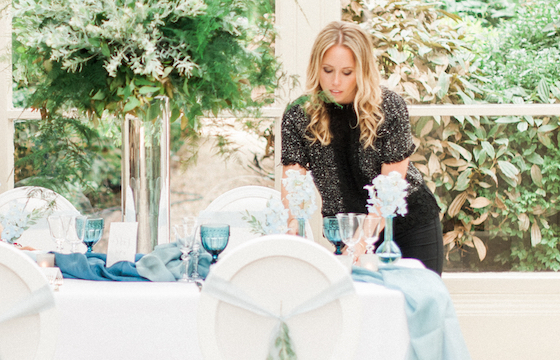 There’s no denying the current wedding trend to use flowers in more creative ways from floral bridal crowns to draping chair backs. 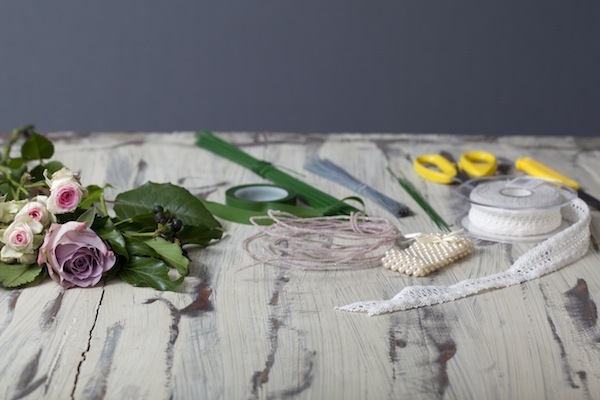 Today I’ve got an easy to follow tutorial for a DIY flower wrist corsage with the help of Interflora. These aren’t your typical prom style corsages but more a fashionable statement. 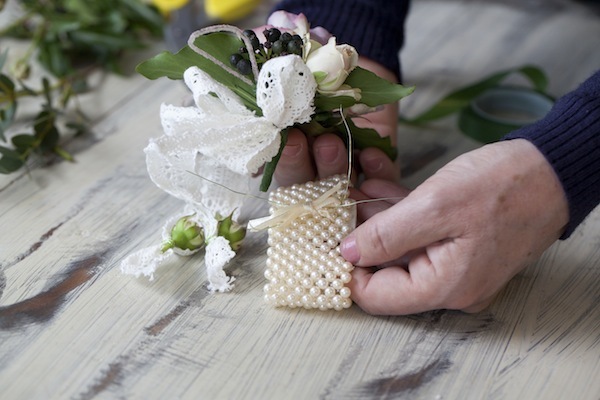 Go big and wear as an alternative to the handheld bridal bouquet, allow your bridesmaids to make their own to compliment their outfit, as a hen party idea or design ones for the Mum’s to wear. 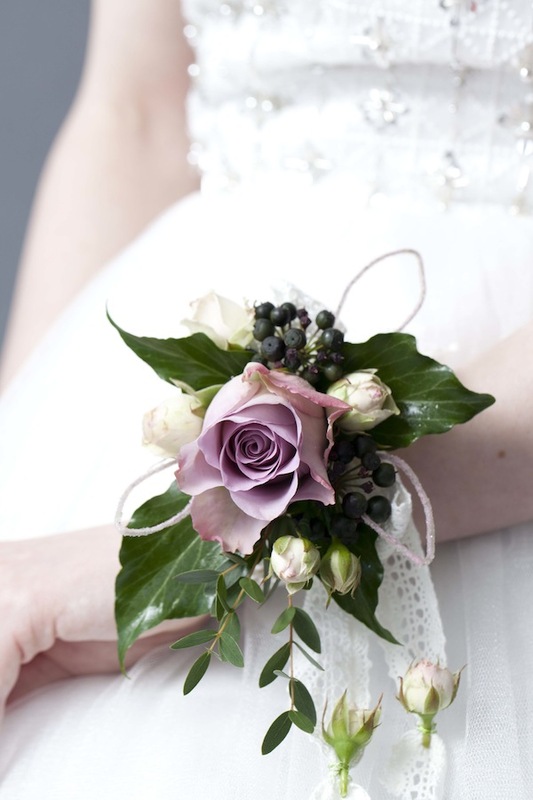 In fact my mum wore a flower wrist corsage for my wedding, as I wanted her to have something special that would stand out from the boys button holes. The first thing you need to do is mount the different flower varieties onto wires. 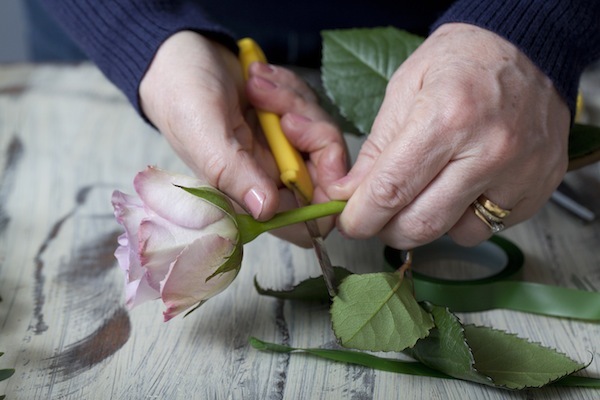 To do this, first cut the flower head off the rose at a slight angle and insert a wire into the stem. 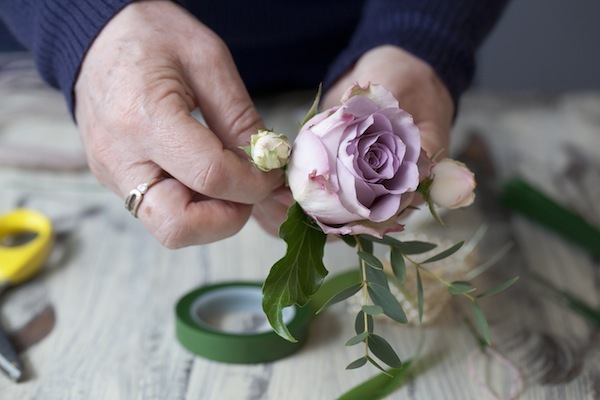 Once the rose is mounted wrap green florist tape around the stem and wire to secure and maintain moisture. Next you need to wire the Spray roses. 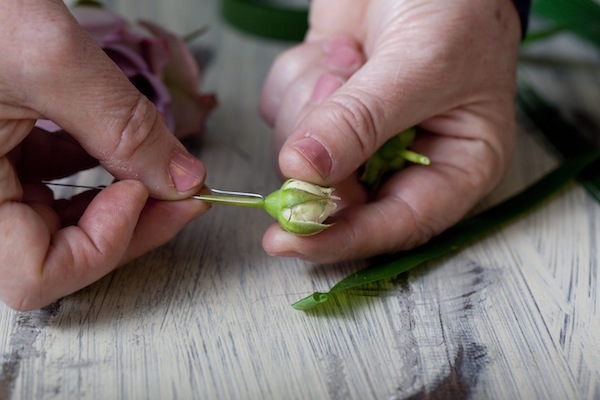 Again, cut the stems short and this time insert a fine florist wire through the neck of the stem before bending back on itself so that the ends run parallel to the stem. Twist the wire ends around the stem and cover with green tape as before. 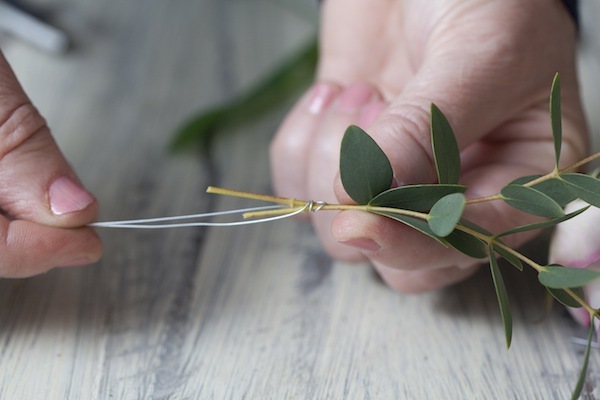 To wire the eucalyptus, snip lengths off the foliage and wrap a wire around the end. 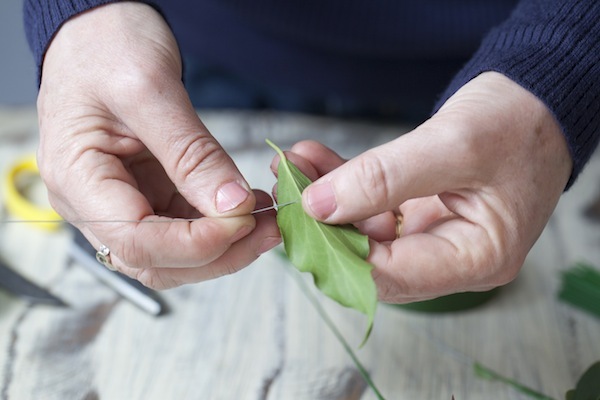 For the ivy leaves, insert a florist wire through the centre of the leaf before folding the ends of the wire downwards and wrapping them around the stem. 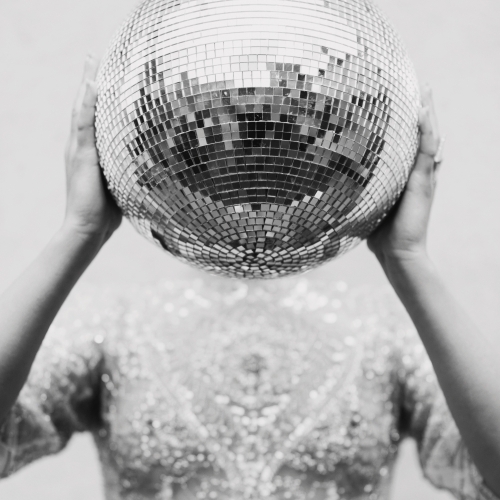 Now it’s time to make some extra decoration for your corsage. 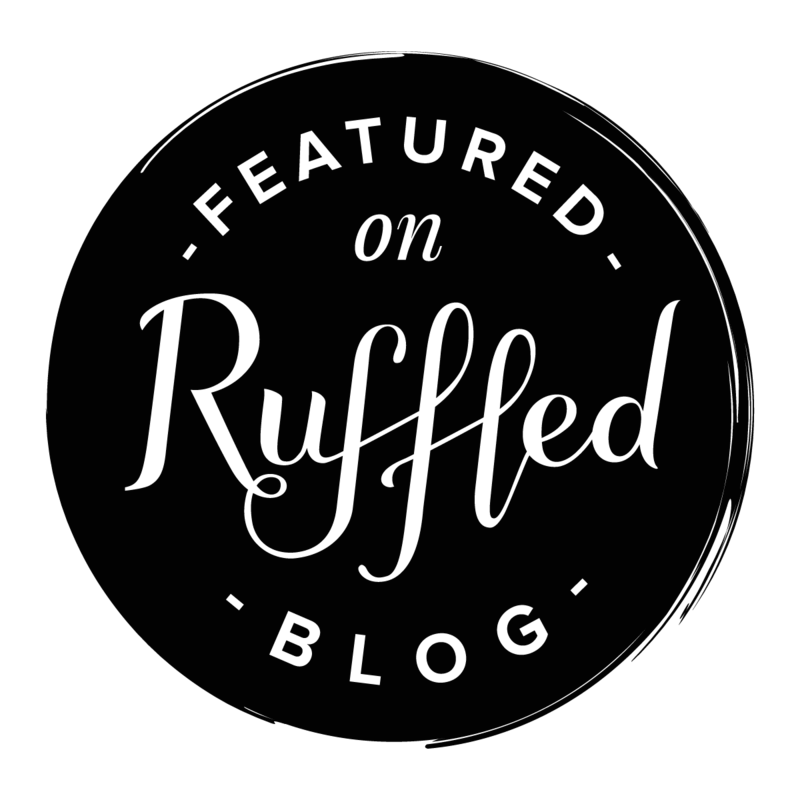 Cut off a length of frosted, decorative wire and create a loop. 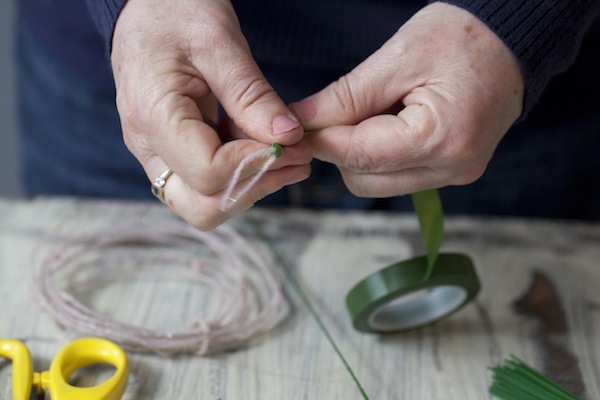 Take a florist wire and use it to secure the ends together, leaving a ‘stem’ of wire at the end which you will need to cover with green florist tape. Repeat, until you have created three loops. When complete leave the loops to one side to add into the design later. 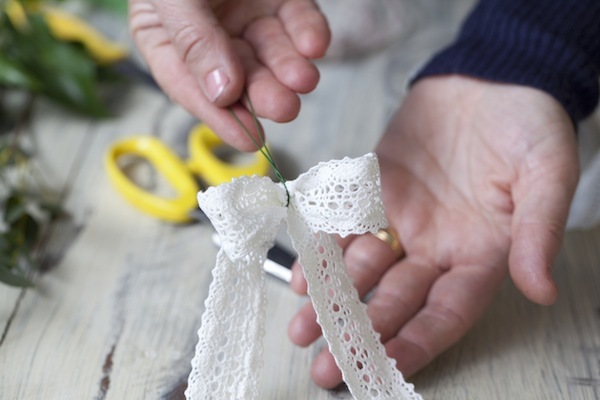 To add a real vintage touch to your corsage cut a length of lace ribbon and fold it to create a bow shape. 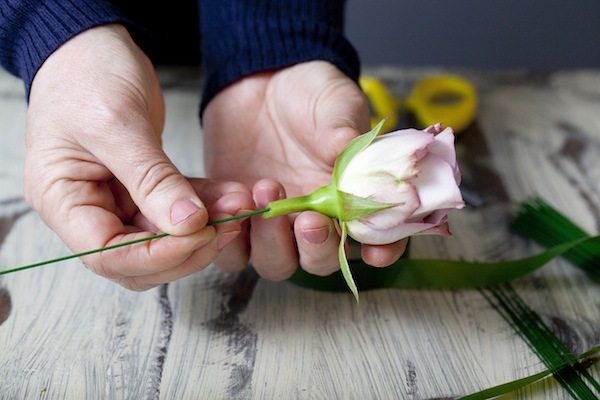 Pinch the centre of the bow between your fingers and thumb and then take a florist wire that has been folded in half and insert it into the centre. Twist the ends of the wire to secure the bow. Next, you need to prepare the bracelet so that the flowers can be added. 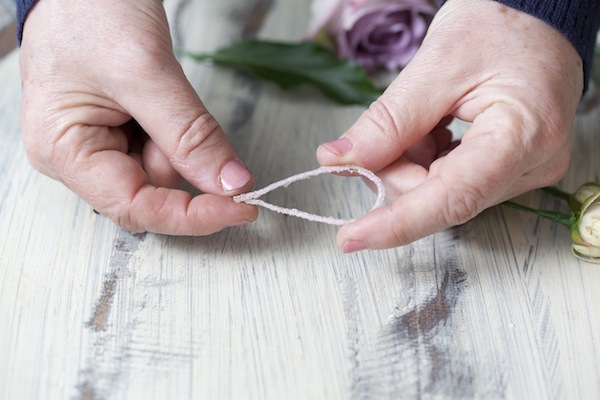 To do this insert two florist wires into the bracelet diagonally to make a cross shape. Start arranging the wired flowers and foliage in your hands until you are happy with the design. Add in the frosted loops you made earlier as well as the tree ivy berries and secure everything together using florist wire. Add some extra decoration onto the bow by tying tiny Spray roses onto the ribbon trails with the decorative, frosted wire. Once complete attach the bow to the flowers again using florist wire to secure the whole thing together. 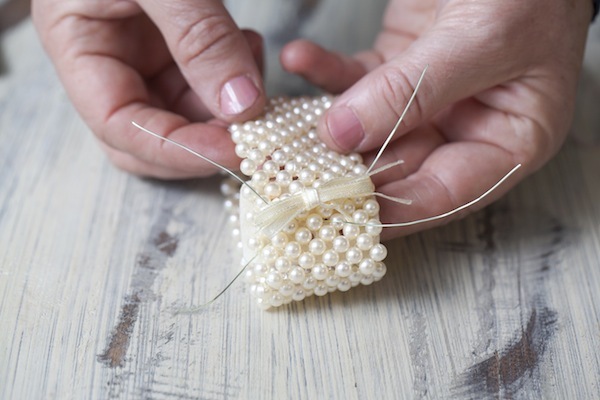 Now your design is complete you simply need to attach it to the pearl bracelet. To do this place the flowers onto the bracelet and thread the wires through the corsage, twisting them together to secure into place. 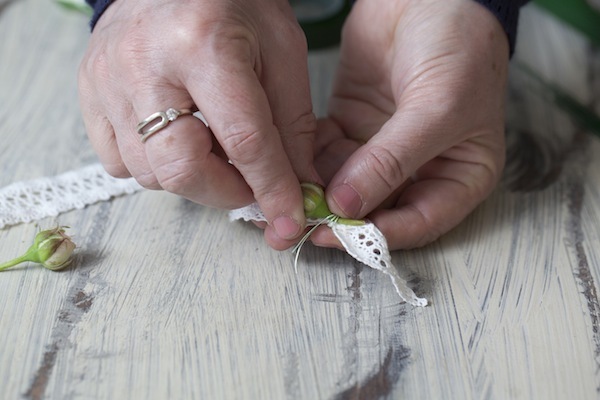 Tuck the ends of the wires in between the flowers to disguise them and trim any excess. Ta dah, there you have it a simple DIY flower wrist corsage that you can customise to suit your style.